Looks like someone at iRobot has recognized the demand for a versatile robotic base by hobbyists and educators. The original vacuum bot has already been widely modified and reprogrammed, to the point of publishing books such as Hacking Roomba: ExtremeTech . Now the vacuum mechanics have been replaced by an open cargo bay, making room for off-the-shelf sensors, actuators, and 3rd party electronics. Who is iRobot Create For? Educators: Teach students the fundamentals of robotics, computer science, and engineering by writing software to control this engaging robot. Roboticists: Budding or advanced robot developers can use this versatile robot to experiment, learn, play, program, and compete. Now you can spend your time programming behaviors and attaching new sensors and actuators to transform the robot into exactly what you want. Mobile out-of-the-box, there is no assembly required. The robot featurs 32 build-in sensors, open cargo bay, and a 25-pin expansion port for additional hardware. The command module (featured on the left) is an optional unit that plugs into the expansion slot and serves as a microcontroller (Atmel ATMega 168), offering complete autonomy, free of any PC connecting cables. The four DB-9 expansion ports further extend additional hardware slots. 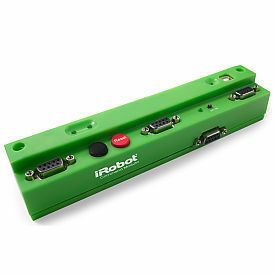 Access to all of the robotâ€™s sensors and actuators over a serial port is provided via the iRobot Open Interface. Fully documented serial protocol provides full access to sensors, actuators, and on-board scripting functionality. For programming robot’s logic, C or C++ are recommended, but a variety of methods and programming languages can be used. The open and documented interface will ultimately support anything that sends proper instructions. The iRobot Create website offers a number of resources: Manuals and Sample Code, forums and Projects. High school and college educators can use the iRobot Create Programmable Robot to teach students the fundamentals of robotics, computer science and engineering. I would have loved to play with robots like that. Actually this is why I am studying Mechatronics Engineering at University right now. Starting at just $130, I think that iRobot’s programmable robot kit is quite affordable, especially in comparison to alternatives (Lego’s Mindstorm is $350). Better yet, there is a price break for a pack of 10, so an entire classroom can be stocked with programmable robotic kits for about $1000. This has got to be better than using old computers, and programming a single parallel port with Turing (as I know some highschools are doing). I really hope that some educators will pick up on this. There is a lot of potential for some amazing programming / hardware / engineering courses! I would definitely love to be able to use these for hands on learning. Much better than my current situation (crappy computers with an even crappier language). Yeah, were building robots from a kit too. It’s a new program, and we’re assembling the board as we speak. damnit, them resistors get ot when you solder them on.